What are the benefits of Dental Surgical Microscopes? Microscopes have proven to be the Golden Standard for the treatment of the smallest dental hard tissues. Here, two- to four-times magnifications are used. Equally important is the shade free illumination of the object. This generally requires a coaxial illumination. For diagnostic or examination issues 8- to 12-fold magnifications are preferred. How can the dentaZOOM® be employed? In case of two- to four-times magnifications the dental loupe (with forehead light), or in addition the dentaZOOM with almost complete coaxial illumination, are generally used. For diagnosis or examinations of intermediate results the dentaZOOM with 5- to 10-fold magnifications is employed. 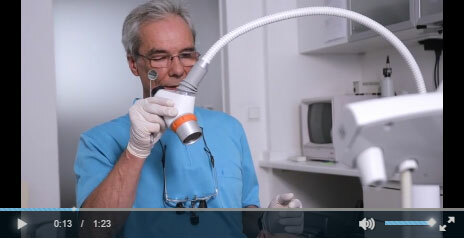 With sufficient training it is also possible to use the dentaZOOM directly. What are the main applications of the dentaZOOM? The dentaZOOM is commonly used in: endodontics, caries diagnostics, tunnel preparation, scaling, apicoectomy. Additional applications are possible. What are the disadvantages of the monocular version? The stereoscopic dental loupe is generally used for two- to four-fold magnification. For examination issues with the necessary five- to ten-fold magnification the 3D-view is of lower importance and therefore redundant. A 3D-effect occurs when gently swinging the generally used mirror. Is it difficult to get accustomed to a monocular view? No, it generally takes a couple of days to get used to a monocular view. At that point, the other eye closes easily or even remains open. Why wasn’t the dentaZOOM introduced earlier? Only with the development of modern LED-technique and optics it became possible to produce such a compact and lightweight instrument.